2013-02-01 Application filed by Danisco Us Inc. filed Critical Danisco Us Inc. The present teachings provide improved methods and compositions comprising phytase and phytic acid. In some embodiments, improved stability of phytase is achieved and employed in such areas as improved animal feed compositions. Number 61 /595,923, filed on February 7, 2012, which is hereby incorporated by reference. compositions, and enzyme solutions of the present teachings to produce heat-treated food or animal feed pellets. The use of active agents, such as enzymes, in foods and animal feed is common. Enzymes are known to improve digestibility of food or animal feed, reduce anti-nutritional factors in food and animal feed, and improve animal productivity. When compared with dry feed mixes, feed pellets have properties that are favored by the industry, such as improved feed quality, decreased pathogens, lower dust levels during manufacture, good handling, and more uniform ingredient dosing. Inactivation of enzymes can occur during industrial food and feed processes (such as pelleting) by, for example, heat treatment, high pressure, shear stress, and chemical treatment (such as pH, surfactant, and solvents). The inactivation is at least partially reversible if the enzyme reactivates after processing, for example, upon cooling after steam treatment and pelleting; the inactivation is irreversible if the catalytic activity does not resume after processing, for example, upon cooling after steam treatment and pelleting. The irreversible inactivation and reduced activity of an enzyme is generally not desirable in processes such as pelleting. l Preferred industry pelleting processes utilize steam injection, in a process known as conditioning, which adds moisture and elevates the temperature prior to the pelleting step which forces the steam heated feed ingredients, or conditioned mash, through a die. The pelleting process temperatures may be from about 70C to 95C, or higher. Because of the steam, temperatures, compression forces and chemicals used in pelleting processes, the activity or potency of enzymes are often significantly reduced during processing and subsequent storage. This problem is illustrated by the fact that feed enzymes are often provided to the industry as stabilized liquid products that are sprayed onto feed pellets after the pelleting process to avoid enzyme inactivation. Homogeneous dosing is difficult to achieve when the enzyme is applied post pelleting, for instance, by spraying the enzyme onto the pellets, and the cost of the equipment to add enzyme post-pelleting is high. Alternatively, liquid enzyme formulations, or dry mix enzyme formulations, may be added to the mixer prior to pelleting. In certain instances, higher levels of enzymes than otherwise needed may be added in order to compensate for losses during pelleting. There is a need in the food and feed industries for stable, durable enzyme granules to serve as components in formulations that are subjected to steam treatment pelleting processes without appreciable loss of enzyme activity. Approaches to avoid the problem of irreversibly inactivating enzymes or reducing the activity of the enzyme in industrial processes include identifying new sources of an enzyme (e.g. the identification of a known enzyme in an extreme thermophile microorganism) or identifying means to stabilize known enzymes. Klibanov, 1983, (Stabilization of Enzymes against Thermal Inactivation, Advances in Applied Microbiology, volume 29, page 1 -28) discloses that there are three basic means for stabilizing enzymes: (1 ) immobilization, (2) chemical modification and (3) inclusion of additives. However, Klibanov (1983) further discloses that any one of these methods could lead to stabilization or destabilization, or have no effect at all. Pace and Grath (J Biol Chem 255:3862, 1980) state that an increased stability of an enzyme in the presence of its substrate, coenzyme, or any small molecule that it binds specifically results because binding to the native state shifts the unfolding equilibrium and decreases the concentration of unfolded states of the enzyme. EP0969089 discloses that amino acid substitutions may affect the stability of phytase with some having a stabilizing effect and others having a destabilizing effect, and some amino acid substitutions having no effect at all. Phytic acid (or phytate when in the salt form) is found in many plant tissues especially bran, seeds and cereals. Phytate phosphorus is poorly digested by monogastric animals such as swine, poultry, fish and man because they lack, or have low levels of, the digestive enzyme phytase in the intestine. EP0619369 and US5554399 disclose enzyme compositions comprising a phytase and an acid phosphatase and use of the enzyme composition in food, pelleted feed and fodder. WO2004071218 discloses increasing the amount of minerals in a food. WO2004071218 discloses a preparation comprising an active phytase, a phytate and an essential cation. WO2004071218 discloses that the preparation may be added to any food or drink product for human consumption or to condiments such as curry powder. composition further comprises a dephosphorylating enzyme such as a phytase. administration. For oral administration, the composition further comprises a dephosphorylating enzyme such as a phytase. administration. For oral administration, the composition may be co-administered with an enzyme which hydrolyses phosphate groups such as a phytase. US4758430 discloses a method for treating Alzheimer's disease by administering a compound selected from the group consisting of phytic acid, a phytate salt, an isomer or hydrolysate of phytic acid or a phytate salt, or a mixture of any combination of these. The phytic acid or phytate salt may be adsorbed onto a solid carrier for administration. For oral administration, the composition further comprises a dephosphorylating enzyme such as a phytase. EP0969089 discloses a stabilizing enzyme formulation comprising phytase and one or more stabilizing agents selected from the group consisting of: C5 sugars; polyethylene glycols having a molecular weight of 600 to 4000 Da; disodium salts of malonic, glutaric and succinic acid; carboxymethylcellulose; and alginate. As an alternative, EP0969089 discloses that phytase can be stabilized by crosslinking with glutaldehyde or by oxidation with sodium periodate and reaction with adipic acid dihydrazine. W09316175 discloses a liquid phytase formulation stabilized by the addition of urea and/or a polyol such as sorbitol and glycerol, and applied to pelleted feed matter. The stabilized liquid formulations of W09316175 are more resistant to heat inactivation of enzyme activity and may be stored for longer periods of time with better retention of phytase activity. Singh and Satyanarayana (Bioresource Technology, 2009; 100: 2046-2051 ) disclose the purification and characterization of a histidine acid phosphatase (HAP) phytase from the thermophilic mould Sporotrichum thermophile. Singh and Satyanarayana (2009) determined the thermostability of the phytase by incubating the enzyme at 60°C and 80°C at pH 3.0, 5.0 and 7.0 buffers. Singh and Satyanarayana (2009) determined the effect of the stabilizers glycerol, trehalose, sorbitol and phytic acid on enzyme activity at 80°C. The present teachings seek to overcome some of these problems. For example, the present teachings can address problems associated with the effect of food and animal feed industrial processes on phytase. For ease of reference we have described elements of the present teachings under one or more headings. It is to be noted that the teachings under each of the headings also apply to the teachings under the other headings. For example, each of the stated embodiment and aspects concerning the use of the present teachings is equally an embodiment or aspect concerning the method of the present teachings or the composition of the present teachings. Likewise, each of the stated embodiments and aspects concerning the method or use of the present teachings is equally an embodiment or aspect concerning the composition of the present teachings. In some embodiments, the present teachings provide a method for increasing the stability of phytase in a composition, the method comprising introducing at least 10 millimolal phytic acid to said composition, wherein the phytase and the phytic acid are in functional proximity. In some embodiments, the present teachings provide a granule composition comprising phytic acid and phytase, wherein the phytase and the phytic acid are in functional proximity. In some embodiments, the present teachings provide a method for improving the recovered activity of phytase in a solid state after admixing said phytase with at least one food or animal feed ingredient and pelleting the resulting admixture with steam treatment, the method comprising; providing phytic acid at a concentration of at least 10 millimolal to the phytase; admixing said phytase with at least one food or animal feed ingredient; and pelleting the resulting admixture with steam treatment, wherein the recovered activity of the phytase is at least 15%, at least 17%, at least 19%, at least 20%, at least 23%, at least 25%, at least 27%, or at least 30% higher as compared to a control phytase not stabilized by at least 10 millimolal phytic acid. In some embodiments, the present teachings provide a pellet composition comprising a granule, wherein the granule comprises phytic acid and phytase in functional proximity, wherein the concentration of phytic acid is at least 10 millimolal. In some embodiments, the present teachings provide a method for producing a heat- treated food or animal feed pellet comprising the steps of: admixing a composition according to any one of claims 17-30 and 32-36 with at least one food or animal feed ingredient; and pelleting the resulting admixture with steam. In some embodiments, the present teachings provide a method for manufacturing a feed composition comprising the steps of: mixing feed components with granules comprising a core and a coating, wherein the core comprises phytase and phytic acid in functional proximity; steam treating said composition, and pelleting said composition. Fig. 1 shows the recovered phytase activity obtained after pelleting at 90°C or 95°C relative to the phytase activity of the mash before pelleting. Fig. 2 shows a Differential Scanning Calorimetry plot of DSC Tm for 0.5mg/ml phytase with and without 15mM phytic acid. Fig. 3 shows a Differential Scanning Calorimetry plot of DSC Tm for 0.5mg/ml phytase with and without 15mM inositol. SEQ ID NO: 2 = BP1 1 , a variant phytase of Buttiauxella sp. comprising 1 1 amino acid substitutions compared to the wild type (SEQ ID NO: 4), lacking the signal sequence (SEQ ID NO: 12). SEQ ID NO: 3 = BP1 1 1 , a variant phytase of Buttiauxella sp. comprising 21 amino acid substitutions compared to the wild type (SEQ ID NO:4), lacking the signal sequence (SEQ ID NO: 12). SEQ ID NO: 4 = wild type phytase encoded by Buttiauxella sp. strain P 1 -29 deposited under accession number NCIMB 41248, lacking the signal sequence (SEQ ID NO: 12). SEQ ID NO: 5 = BP17 with an additional amino acid substitution E121 T.
SEQ ID NO: 6 = BP17 with an additional amino acid substitution P394N. SEQ ID NO: 7 = BP17 with an additional amino acid substitution D386N. SEQ ID NO: 8 = BP17 with additional amino acid substitutions K202N and N204T. SEQ ID NO: 10 : = BP17 with an additional amino acid substitution P373T. SEQ ID NO: 1 1 : = BP17 with an additional amino acid substitution Q76N. SEQ ID NO: 12 : = signal sequence for wild type (SEQ ID NO: 4). Dictionary of Biology, Harper Perennial, NY (1991 ) provide one of skill with a general dictionary of many of the terms used in this invention. Any methods and materials similar or equivalent to those described herein can be used in the practice or testing of the present teachings. Numeric ranges provided herein are inclusive of the numbers defining the range. Unless otherwise indicated, nucleic acids are written left to right in 5' to 3' orientation; amino acid sequences are written left to right in amino to carboxy orientation, respectively. As used herein, the term "phytic acid" refers to inositol hexaphosphate (IP6), but as IP6 generally doesn't exist in pure form, the term also encompasses inositol phosphates that are catabolites of IP6, including inositol pentaphosphate (IP5), inositol tetraphosphate (IP4), inositol triphosphate (IP3), inositol diphosphate (IP2), and inositol monophosphate (IP1 ), salts thereof, and mixtures thereof. The term "phytic acid" does not refer to inositol, the fully hydrolyzed product of phytic acid (IPO). Thus, the term "phytic acid" encompasses catabolites, hydrolysis products, salts and analogs (e.g. esters and salts). As used herein, the terms IP6, IP5, IP4, IP3, IP2, IP1 , and salts thereof, refer to any isomer of that particular inositol phosphate. While IP6, IP5, IP4, IP3, IP2, and IP1 in salt form are typically referred to as "phytates", as used herein the term "phytic acid" also includes such phytates. The phytate counterion is typically sodium (such as sodium phytate). However the counterion may be, for example, calcium, magnesium, iron or zinc. Hence, the term "phytic acid" as used herein includes references to the acid form and the salt form of phytic acid. In certain embodiments, the phytic acid is the acid form or combinations of acid forms. In certain embodiments the phytic acid is the salt form or combinations of salt forms. In certain embodiments the phytic acid is a combination of the acid form (or combinations of acid forms) and the salt form (or combinations of salt forms). As used herein, the term "millimolal" is used for both liquids and solids. The term "millimolal" for solutions (liquids) is used herein as defined in the scientific literature - i.e. the molality of a solution is defined as the amount in moles of a constituent (which here is phytic acid) divided by the mass of the solvent in kilograms (which here is everything in the solution other than phytic acid). Thus, 1 ,000 millimolal is equivalent to 1 molal. The term "millimolal" for solids in the present context is defined as the amount of phytic acid (in millimoles) divided by the mass of solvent of the solid (e.g. the enzyme layer of granule), wherein the solvent is defined as being the non-phytic acid solids (such as in the enzyme layer of a granule which comprises phytase and phytic acid). A "feed" and a "food," respectively, means any natural or artificial diet, meal or the like or components of such meals intended or suitable for being eaten, taken in, digested, by a non- human animal and a human being, respectively. As used herein, the term "food" is used in a broad sense - and covers food and food products for humans as well as food for non-human animals (i.e. a feed). The term "feed" is used with reference to products that are fed to animals in the rearing of livestock. The terms "feed" and "animal feed" are used interchangeably. In a preferred embodiment, the food or feed is for consumption by non-ruminants and ruminants. Examples of ruminants include cows, sheep, goats and horses. Examples of non-ruminant animals include mono-gastric animals such as pigs, poultry (such as chickens and turkeys), fish (such as salmon), dogs, cats, and humans. The food or feed may be in the form of a solution or as a solid - depending on the use and/or the mode of application and/or the mode of administration. In some embodiments, the enzymes mentioned herein may be used as - or in the preparation or production of - a food or feed substance. As used herein the term "food or feed ingredient" includes a formulation, which is or can be added to foods or foodstuffs and includes formulations which can be used at low levels in a wide variety of products. The food ingredient may be in the form of a solution or as a solid - depending on the use and/or the mode of application and/or the mode of administration. The enzymes described herein may be used as a food or feed ingredient or in the preparation or production. The enzymes may be - or may be added to - food supplements. Feed compositions for monogastric animals typically include composition comprising plant products which contain phytate. Such compositions include cornmeal, soybean meal, rapeseed meal, cottonseed meal, maize, wheat, barley and sorghum-based feeds. The enzymes described herein may be - or may be added to - foods or feed substances and compositions. The present teachings also provide a method of preparing a food or a feed ingredient or supplement, the method comprising admixing or adding the enzymes produced by the process of the present description, or modified enzymes of the description, or a composition comprising enzymes according to the present description with another food ingredient. The method for preparing a feed or a food ingredient is also another embodiment of the present description. Such methods may involve pelleting. To prepare a food or feed ingredient, the enzymes of the description can be added in the form of a solid, a formulation such as a pre-mix, or a liquid. "polypeptide," "protein," and "peptide," and are used interchangeably. Where such amino acid sequences exhibit activity, they may be referred to as an "enzyme." The conventional one- letter or three-letter codes for amino acid residues are used, with amino acid sequences being presented in the standard amino-to-carboxy terminal orientation (i.e., N→C). The term "nucleic acid" encompasses DNA, RNA, heteroduplexes, and synthetic molecules capable of encoding a polypeptide. Nucleic acids may be single stranded or double stranded, and may be chemical modifications. The terms "nucleic acid" and "polynucleotide" are used interchangeably. Because the genetic code is degenerate, more than one codon may be used to encode a particular amino acid, and the present compositions and methods encompass nucleotide sequences that encode a particular amino acid sequence. Unless otherwise indicated, nucleic acid sequences are presented in 5'-to-3' orientation. By "homologue" shall mean an entity having a specified degree of identity with the subject amino acid sequences and the subject nucleotide sequences. A homologous sequence is taken to include an amino acid sequence that is at least 75%, 80%, 85%, 86%, 87%, 88%, 89%, 90%, 91 %, 92%, 93%, 94%, 95%, 96%, 97%, 98% or even 99% identical to the subject sequence, using the conventional sequence alignment tool Clustal V with default parameters. Typically, homologues will include the same active site residues as the subject amino acid sequence, though may include any number of conservative amino acid substitutions. As used herein, the term "phytase" means a protein or polypeptide which is capable of catalysing the hydrolysis of esters of phosphoric acid, including phytate/phytic acid, and releasing inorganic phosphate. Illustrative phytases are discussed and referenced throughout the present teachings, and includes E. Coli phytase (US Patent 6,1 10,719), and those obtained from any of a variety of sources, including Ascomycetes, Aspergillus awamori, Aspergillus niger, Thermomyces, Humicola, Basidiomycetes, Bacillus subtilis, and Schwannniomyces occidentalis. Some phytases in addition to phytate are capable of hydrolysing at least some of the inositol-phosphates of intermediate degrees of phosphorylation. In one embodiment, the active enzyme produced or modified in the present teachings is a 6-phytase. The 6-phytase is also called "4-phytase" or "phytate 6-phosphatase". Further phytases include histidine acid phytases (HAP), which is a group comprising members found among prokaryotes (e.g. appA phytase from Escherichia coli) and eukaryotes (phyA and B from Aspergillus sp., HAP phytases from yeast and plants. HAP phytases share a common active site motif, RHGXRXP, at the N- terminal end and a HD motif at the C-terminal end in their DNA sequences. The present phytases may be "precursor," "immature," or "full-length," in which case they include a signal sequence, or "mature," in which case they lack a signal sequence. Mature forms of the polypeptides are generally the most useful. Unless otherwise noted, the amino acid residue numbering used herein refers to the mature forms of the respective phytase polypeptides. The present amylase polypeptides may also be truncated to remove the N or C- termini, so long as the resulting polypeptides retain phytase activity. The terms, "wild-type," "parental," or "reference," with respect to a polypeptide, refer to a naturally-occurring polypeptide that does not include a man-made substitution, insertion, or deletion at one or more amino acid positions. Similarly, the terms "wild-type," "parental," or "reference," with respect to a polynucleotide, refer to a naturally-occurring polynucleotide that does not include a man-made nucleoside change. However, note that a polynucleotide encoding a wild-type, parental, or reference polypeptide is not limited to a naturally-occurring polynucleotide, and encompasses any polynucleotide encoding the wild-type, parental, or reference polypeptide. The term "variant," with respect to a polypeptide, refers to a polypeptide that differs from a specified wild-type, parental, or reference polypeptide in that it includes a man-made substitution, insertion, or deletion at one or more amino acid positions. Similarly, the term "variant," with respect to a polynucleotide, refers to a polynucleotide that differs in nucleotide sequence from a specified wild-type, parental, or reference polynucleotide. The identity of the wild-type, parental, or reference polypeptide or polynucleotide will be apparent from context. A "vector" refers to a polynucleotide sequence designed to introduce nucleic acids into one or more cell types. Vectors include cloning vectors, expression vectors, shuttle vectors, plasmids, phage particles, cassettes and the like. An "expression vector" refers to a DNA construct comprising a DNA sequence encoding a polypeptide of interest, which coding sequence is operably linked to a suitable control sequence capable of effecting expression of the DNA in a suitable host. Such control sequences may include a promoter to effect transcription, an optional operator sequence to control transcription, a sequence encoding suitable ribosome binding sites on the mRNA, enhancers and sequences that control termination of transcription and translation. As used herein, the term "expression" refers to the process by which a polypeptide is produced based on a nucleic acid sequence. The process includes both transcription and translation. A "promoter" refers to a regulatory sequence that is involved in binding RNA polymerase to initiate transcription of a gene. The promoter may be an inducible promoter or a constitutive promoter. A non-limiting example of an inducible promoter which may be used is Trichoderma reesei cbhl , which is an inducible promoter. (including but not limited to juxtaposition) permitting them to function in an intended manner. For example, a regulatory sequence is operably linked to a coding sequence if the expression of the coding sequence is under control of the regulatory sequences. .
A "host strain" or "host cell" is an organism into which an expression vector, phage, virus, or other DNA construct, including a polynucleotide encoding a polypeptide of interest (e.g., a phytase) has been introduced. Exemplary host strains are Trichoderma sp. The term "host cell" includes protoplasts created from cells. The term "recombinant," when used in reference to a subject cell, nucleic acid, protein or vector, indicates that the subject has been modified by the introduction of a heterologous nucleic acid or protein or the alteration of a native nucleic acid or protein, or that the cell is derived from a cell so modified. Thus, for example, recombinant cells express genes that are not found within the native (non-recombinant) form of the cell, or express native genes at different levels or under different conditions than found in nature. "leader peptide") refers to a sequence of amino acids bound to the N-terminal portion of a protein which facilitates the secretion of the mature form of the protein from the cell (e.g. SEQ ID NO: 12). The signal sequence targets the polypeptide to the secretory pathway and is cleaved from the nascent polypeptide once it is translocated in the endoplasmic reticulum membrane. The mature form of the extracellular protein (e.g. SEQ ID NO: 1 ) lacks the signal sequence which is cleaved off during the secretion process. A "selective marker" or "selectable marker" refers to a gene capable of being expressed in a host to facilitate selection of host cells carrying the gene. Examples of selectable markers include but are not limited to antimicrobials (e.g., hygromycin, bleomycin, or chloramphenicol) and/or genes that confer a metabolic advantage, such as a nutritional advantage on the host cell. The term "derived from" encompasses the terms "originated from," "obtained from," "obtainable from," "isolated from," and "created from." "Filamentous fungi" refers to all filamentous forms of the subdivision Eumycotina and Oomycota (See, Alexopoulos, C. J. (1962), Introductory Mycology, Wiley, New York). These fungi are characterized by a vegetative mycelium with a cell wall composed of chitin, cellulose, and other complex polysaccharides. The filamentous fungi of the present teachings are morphologically, physiologically, and genetically distinct from yeasts. Vegetative growth by filamentous fungi is by hyphal elongation and carbon catabolism is obligatorily aerobic. In the present teachings, the filamentous fungal parent cell may be a cell of a species of Trichoderma, e.g., Trichoderma reesei (previously classified as T. longibrachiatum and currently also known as Hypocrea jecorina), Trichoderma viride, Trichoderma koningii, or Trichoderma harzianum. Additional filamentous fungi include Aspergillus, Fusarium, Chrysosporium, Penicillium, Humicola, Neurospora, Myceliophthora, or alternative sexual forms thereof such as Emericella, Hypocrea. The term "culturing" refers to growing a population of microbial cells under suitable conditions for growth, in a liquid or solid medium. The term "heterologous" with reference to a polynucleotide or protein refers to a polynucleotide or protein that does not naturally occur in a host cell. The term "endogenous" with reference to a polynucleotide or protein refers to a polynucleotide or protein that occurs naturally in the host cell. As used herein, the terms "transformed," "stably transformed," and "transgenic," used with reference to a cell means that the cell contains a non-native (e.g., heterologous) nucleic acid sequence integrated into its genome or carried as an episome that is maintained through multiple generations. The term "introduced" in the context of inserting a nucleic acid sequence into a cell, means "transfection", "transformation" or "transduction," as known in the art. The terms "isolated" and "separated" refer to a compound, protein (polypeptides), cell, nucleic acid, amino acid, or other specified material or component that is removed from at least one other material or component with which it is naturally associated as found in nature. As used herein, the term "purified" refers to material (e.g., an isolated polypeptide or polynucleotide) that is in a relatively pure state, e.g., at least about 90% pure, at least about 95% pure, at least about 98% pure, or even at least about 99% pure. As used herein, the terms "modification" and "alteration" are used interchangeably and mean to change or vary. In the context of modifying or altering a polypeptide, these terms may mean to change the amino acid sequence, either directly or by changing the encoding nucleic acid, or to change the structure of the polypeptide such as by glycosylating the enzyme. The term "glycosylation" as used herein refers to the attachment of glycans to molecules, for example to proteins. Glycosylation may be an enzymatic reaction. The attachment formed may be through covalent bonds. The phrase "highly glycosylated" refers to a molecule such as an enzyme which is glycosylated at all or nearly all of the available glycosylation sites, for instance N-linked glycosylation sites. The term "glycan" as used herein refers to a polysaccharide or oligosaccharide, or the carbohydrate section of a glycoconjugate such as a glycoprotein. Glycans may be homo- or heteropolymers of monosaccharide residues. They may be linear or branched molecules. As used herein, the term "solid support" refers to an inert solid material on to which the phytase and phytic acid is sprayed. Optionally other materials - such as enzymes, water soluble agents, dispersible agents, and other components suitable for granules - can also be sprayed onto the solid support. Examples of solid supports include, but are not limited to, sodium sulphate, magnesium sulphate, granulated sucrose, starch-sucrose non-pareils (ASNP) and maltodextrin. As used herein, the term "granule" refers to a core which may or may not have coating layer(s). As used herein, the term "multi-layered granule" refers to a composition comprising a core and at least one coating layer. The term "core" as used herein is interchangeable with the term "seed". The term "coating layer" and "layer" as used herein are interchangeable. The coating layer(s) generally encapsulates the core in order to form a substantially continuous layer so that the core surface has few or no uncoated areas. The materials (e.g. the agents, components and enzyme detailed herein) used in the granule and/or multi-layered granule are suitable for the use in foods and/or animal feeds. The materials can be food grade or feed grade. The term "outer coating layer" as used herein refers to the coating layer of the multi- layered granule which is the furthest from the core (i.e. the last coating layer which is applied). As used herein, the term "functional proximity" means that the proximity of phytic acid and phytase is such that the phytic acid is capable of stabilizing the phytase. For example, phytic acid and phytase are both in the same layer of a granule; for instance, phytic acid and phytase are both in the core and/or phytic acid and phytase are both in the same coating layer. In another example, phytic acid and phytase are in adjacent coating layers of a granule. In a further example, phytase is in the core and phytic acid is in the adjacent coating layer. As used herein, the term "enzyme coating layer" refers to an enzyme layer which comprises at least one enzyme. In some embodiments the enzyme layer comprises at least two enzymes. In some embodiments, the enzyme layer comprises at least three enzymes. "NCIMB" is the name of a depository for organisms located in Aberdeen, Scotland named The National Collection of Industrial, food, and Marine Bacteria. As used herein, the terms "pellets" and "pelleting" refer to solid, rounded, spherical and cylindrical tablets or pellets and the processes for forming such solid shapes, particularly feed pellets and solid, extruded animal feed. Known food and animal feed pelleting manufacturing processes generally include admixing together food or feed ingredients for about 1 to about 5 minutes at room temperature, transferring the resulting admixture to a surge bin, conveying the admixture to a steam conditioner, optionally transferring the steam conditioned admixture to an expander, transferring the admixture to the pellet mill or extruder, and finally transferring the pellets into a pellet cooler. Fairfield, D. 1994. Chapter 10, Pelleting Cost Center. In Feed Manufacturing Technology IV. (McEllhiney, editor), American Feed Industry Association, Arlington, Va., pp. 1 10-139. As used herein, the term "heat-treated food or animal feed pellets" refers to unpelleted admixtures which are subjected to a heat treatment (such as steam conditioning), typically at a temperature of at least 90°C for at least 30 seconds (such as for example 30 seconds at 90°C and/or 30 seconds at 95°C). The admixture can then be extruded to form the animal feed pellets. As used herein, the term "stability" refers to any of a variety of effects in which the enzymatic activity or other functional property of a phytase enzyme is beneficially maintained or improved. A phytase can exhibit stability by showing any of improved "recovered activity," "thermostability", and/or "inactivity reversibility." As used herein, the term "recovered activity" refers to the ratio of (i) the activity of a phytase after a treatment involving one or more of the following stressors: heating, increased pressure, increased pH, decreased pH, storage, drying, exposure to surfactant(s), exposure to solvent(s), and mechanical stress) to (ii) the activity of the phytase before the treatment. The recovered activity may be expressed as a percentage. In the context of pelleting experiments, the "activity before treatment" can be approximated by measuring the phytase activity present in the mash that does not undergo treatment in a manner that is otherwise matched to the phytase that does undergo treatment. For example, the phytase in the untreated mash is handled and stored for a similar time and under similar conditions as the phytase in the treated mash, to control for possible interactions or other effects outside of the specified treatment per se. As used herein, the term "control phytase" in conjunction with a phytase, refers to the same kind of phytase molecule (e.g. BP17 phytase) as that which has a stabilizing agent added (e.g. -phytic acid is present), except that the stabilizing agent was lacking. For example, in one sample phytase BP17 is stabilized with phytic acid and in the comparative control phytase sample the only difference is that phytase BP17 has not been stabilized with phytic acid, such a phytase being a "control phytase". molybdate/vanadate reagent, and phosphate is quantified by intensity of yellow colored complex of the vanadomolybdophosphor. As used herein, melting temperature (Tm) of the enzyme can be measured by techniques known in the art. One suitable technique is differential scanning calorimetry (DSC). Other suitable techniques for determining melting temperatures include light scattering, circular dichroism and enzymology experiments. DSC is a thermoanalytical technique. It is used to measure the amount of energy required to maintain the temperature of a sample at any one temperature across a range of temperature. As the tested temperature increases, a sample eventually reaches its melting temperature. The melting temperature Tm is observed as an endothermic peak in the DSC graph. As used herein, the term "DSC Tm" refers to the melting temperature of the enzyme as measured by DSC at a scan rate of 90C/min and a solution pH of 5.5. 30/50=.6=60%) as compared to the "control phytase" i.e. phytase that was not stabilized by phytic acid. In some embodiments, these improvements can be accompanied by improvements in thermostability, for example Tm as measured by DSC Tm. In some embodiments, these improvements can be accompanied by improvements in inactivity reversibility (that is, the ability of lost activity to be recovered after a period of time). The present teachings provide the surprising observation that the thermal stabilization of a phytase enzyme after pre-incubation with molar excess of its substrate or its potential substrate analog results in stability of the enzyme in either a dried or liquid form. More specifically, the present teachings provide that the stability of phytase can be improved including phytic acid in functional proximity to the phytase. Further, the present teachings provide an excess of phytic acid can improve the stability of phytase during food and animal feed processing and can result in heat-treated food and animal feed pellets which have improved phytase activity. In some embodiments, the phytic acid comprises the unhydrolyzed inositol phosphate, IP6. Typically, commercial sources of phytic acid are not pure IP6. In some embodiments, the phytic acid is a mixture of partially hydrolyzed inositol phosphates (e.g. IP6, IP5, IP4, IP3, IP2 and IP1 ). Thus, useful types of phytic acid are phytic acid catabolites, hydrolysis products, salts and analogs (e.g. esters and salts). Inositol (the fully hydrolyzed product of phytic acid - IPO) may be present in the source of phytic acid for use in the present teachings but we have found that under some conditions inositol on its own does not stabilize phytase. Thus, in accordance with the present teachings inositol phosphates are useful for the stabilization of phytase in feed or food composition. The phytic acid for use in the present teachings may be chemically synthesized. In addition or alternatively, the phytic acid for use in the present teachings may be present in or derived from a food, animal feed or ingredients thereof. Phytic acid is found in the hulls of nuts, seeds and grains. Sources of phytic acid include, but are not limited to, linseeds, sesame seeds, almonds, brazil nuts, coconuts, peanuts, walnuts, maize (corn), oats, oat meal, rice, wheat, beans, chickpeas, soybeans, tofu and potatoes. Typically, phytic acid is obtained from grains (such as corn, wheat or rice) though extraction into water. The phytic acid which is used for stabilizing phytase is in addition to the amount of phytic acid which may inherently be present in the ingredients of a food or animal feed which the phytase (such as in the form of a multi-layered granule) is admixed with before pelleting. In other words, the phytic acid which is used for stabilizing phytase is an exogenous phytase; the phytic acid present in the ingredients of a food or animal feed is an endogenous phytic acid. Accordingly, the calculated greater than 10 millimolal phytic acid provided by the present teachings, and other stated millimolal levels for stabilizing phytase provided by the present teachings, does not include trace amounts of endogenous phytic acid. Any means may be used to provide phytic acid to the phytase. For example, a liquid comprising phytic acid may be admixed with a liquid comprising phytase. In a further example, the phytase and phytic acid are in a granule, for example a multi-layered granule. As used herein, the term "phytase" means a protein or polypeptide which is capable of catalyzing the hydrolysis of esters of phosphoric acid, including phytate and phytic acid, and releasing inorganic phosphate. Some phytases in addition to phytate are capable of hydrolyzing at least some of the inositol-phosphates of intermediate degrees of phosphorylation. The term "phytase" may be one phytase or a combination of phytases unless the context clearly dictates otherwise. Phytase enzymes, such as e.g. the 6-phytase BP17 derived from Buttiauxella sp., are added to foods and animal feeds to increase phosphate availability thus increasing the nutritional value of the product. The processing of the food or animal feed, for example under heat and high pressure, can denature the phytase and reduce its activity. The phytase used in the present teachings may be any phytase which is suitable for use in foods or animal feeds. In one embodiment, the active enzyme produced or modified in the current description is a phytase, more in particular a 6-phytase. Aspergillus sp., HAP phytases from yeast and plants. HAP phytases share a common active site motif, RHGXRXP, at the N-terminal end and a HD motif at the C-terminal end in their DNA sequences. This allows a two-step mechanism in the hydrolysis of phosphomonoesters. The phyA and phyB from A. niger and appA from E coli are the representatives which have been the most characterized. In one embodiment, the phytase is 6-phytase, an E coli phytase, an Aspergillus phytase, or Ronozyme phytase (DSM Corporation). In a highly preferred embodiment, the active enzyme to be produced or modified is BP17. BP17 is an enzyme variant of a Buttiauxella sp. phytase. The sequence for BP17 (excluding signal peptide), which is used as a reference for position numbering of amino acids throughout, is shown as SEQ ID No. 1 . In another embodiment, the active enzyme to be is produced or modified BP1 1 . BP1 1 is an enzyme variant of a Buttiauxella sp. phytase. The sequence for BP1 1 (excluding signal peptide) is shown as SEQ ID No. 2. In another embodiment, the active enzyme to be produced or modified is BP1 1 1 . BP1 1 1 is an enzyme variant of a BuWauxella sp. phytase. The sequence for BP1 1 1 (excluding signal peptide) is shown as SEQ ID No. 3. All of these phytases are variants of the wild-type sequence such as that derived from BuWauxella sp. strain P 1 -29 deposited under accession number NCIMB 41248, having the sequence is shown as SEQ ID No. 4. The above detailed phytase enzymes are mature proteins lacking a signal sequence. The appropriate signal sequence derived from BuWauxella sp. strain P 1 -29 deposited under accession number NCIMB 41248, is shown as SEQ ID No. 12. In one embodiment, the phytase is produced in a Trichoderma host cell. In some embodiments, the phytase is produced in a Trichoderma host cell that comprises a deletion of the endo-N-acetyl glucosaminidase gene. The endo-N-acetyl glucosaminidase gene encodes the enzyme endo-N-acetyl glucosaminidase which removes N-linked glycosylation from other proteins such as phytases. In some embodiments, the phytase is phytase BP17 produced in a Trichoderma host cell that comprises a deletion of the endo-N-acetyl glucosaminidase gene. Exemplary strains are taught for example in WO 09/1 14380, see for instance Example 5. The amount of Phytase Units added to the food or animal feed will depend on the composition of the food or feed itself. Foods and feeds containing lower amounts of available phosphorous will generally require higher amounts of phytase activity. The amount of phytase required may be determined by the skilled person. In one embodiment, the amount of phytase incorporated into in a food or animal feed may be between 0.1 to 20 Units Phytase activity per gram of the food or animal feed. Typically, the amount of phytase is about 50 grams (12,000 U/g phytase granule) per ton (1 ,000kg) of food or animal feed; this is equivalent to 0.6 units phytase per gram of food or animal feed. In one embodiment, the phytase is in solution. In another embodiment, the phytase is in the solid state. In a further embodiment, the phytase is spray dried onto a solid support. In another embodiment, the phytase is incorporated into a granule such as a multi-layered granule. In some embodiments, the phytase is in a food or animal feed. In one embodiment, the phytase and/or phytic acid are in solution. In an alternative embodiment, the phytase and/or phytic acid are in the solid state (such as in a granule, for example a multi-layered granule). In some embodiments, the phytase and/or phytic acid are spray dried on to a solid support. Examples of solid supports include, but are not limited to, sodium sulphate, magnesium sulphate, granulated sucrose, starch-sucrose non-pareils (ASNP) and maltodextrin. In one embodiment, the phytase and phytic acid are incorporated into a multi-layered granule. In some embodiments, the phytase and phytic acid are incorporated into the same layer of the multi-layered granule. In one embodiment of the present teachings, there are at least 3 moles of phytic acid for every mole of phytase. The stability of a phytase may be improved in the liquid state and/or in the solid state compared to that of the control phytase which has not been stabilized by the use of phytic acid. In one embodiment, phytase is stabilized by at least 10 millimolal of phytic acid. In some embodiments, phytase is stabilized by at least 20, at least 50, at least 100 millimolal, or at least 150 millimolal of phytic acid. In another embodiment, phytase is stabilized by phytic acid in the range of 10 millimolal to 150 millimolal. In other embodiments, phytase is stabilized by phytic acid in the range of 10 millimolal to 100 millimolal. In some embodiments, phytase is stabilized by phytic acid in the range of 20 millimolal to 150 millimolal. In other embodiments, phytase is stabilized by phytic acid in the range of 20 millimolal to 100 millimolal. In some embodiments, phytase is stabilized by phytic acid in the range of 50 millimolal to 150 millimolal. In other embodiments, phytase is stabilized by phytic acid in the range of 50 millimolal to 100 millimolal. In some embodiments, phytase is stabilized by phytic acid in the range of 100 millimolal to 150 millimolal. In some embodiments, the phytic acid is present at less than 5%, 2%, 1 %, .5%, .1 %, .05%, .01 %, .005%, .001 % weight/weight, expressed as weight of phytic acid to weight on an entire granule in which the phytic acid resides, including layers, if present, that lack phytic acid. In further embodiments, the molar ratio of phytic acid and phytase in functional proximity is 1 :1 , 2:1 , 3:1 , 5:1 , 10:1 , 20:1 , 25:1 or 50:1 . In one embodiment, after treatment (e.g. heating, increased pressure, increased pH, decreased pH, storage, drying, exposure to surfactant(s), exposure to solvent(s), and/or mechanical stress) the stabilized phytase has a phytase activity which is at least 10%, at least 15%, at least 20%, at least 25%, at least 30%, at least 40%, at least 50%, or at least 60% higher than that of the control phytase which has not been stabilized by the use of phytic acid. In one embodiment, after treatment (e.g. heating, increased pressure, increased pH, decreased pH, storage, drying, exposure to surfactant(s), exposure to solvent(s), and/or mechanical stress) the stabilized phytase has a phytase activity which is 10%-60% higher than that of the control phytase which has not been stabilized by phytic acid. In one embodiment, the enzymatic activity of a stabilized phytase after treatment (e.g. heating, increased pressure, increased pH, decreased pH, storage, exposure to surfactant(s), exposure to solvent(s), and/or mechanical stress) is at least 65%, at least 70%, at least 75%, at least 80%, at least 85%, at least 90%, or at least 95% that of the stabilized phytase before the treatment. In one embodiment, at least 65%, at least 70%, at least 75%, at least 80%, at least 85%, at least 90%, or at least 95% phytase activity is recovered. In one embodiment, at least 65%, at least 70%, at least 75%, at least 80%, at least 85%, at least 90%, or at least 95% phytase activity is recovered in the solid state during food or animal feed pelleting. In one embodiment, at least 65%, at least 70%, at least 75%, at least 80%, at least 85%, at least 90%, or at least 95% phytase activity is recovered after treatment (e.g. heating, increased pressure, increased pH, decreased pH, storage, exposure to surfactant(s), exposure to solvent(s), and/or mechanical stress). For example, at least 80% phytase activity is recovered after treatment. In one embodiment, at least 65%, at least 70%, at least 75%, at least 80%, at least 85%, at least 90%, or at least 95% phytase activity is recovered after food or animal feed pelleting. For example, at least 80% phytase activity is recovered after food or animal feed pelleting. In some embodiments, at least 65%, at least 70%, at least 75%, at least 80%, at least 85%, at least 90%, or at least 95% phytase activity is recovered in the solid state after food or animal feed pelleting. For example, at least 80% phytase activity is recovered in the solid state after food or animal feed pelleting. In one embodiment, the recovered activity of a phytase stabilized by phytic acid is improved by at least 15%, at least 17%, at least 19%, at least 20%, at least 23%, at least 25%, at least 27%, at least 30%, at least 32%, at least 35%, at least 40%, at least 42%, or at least 45% compared to the control phytase not stabilized by phytic acid. For example, the recovered activity of a phytase stabilized by phytic acid is improved by at least 23% compared to the control phytase not stabilized by phytic acid. In one embodiment, the recovered activity of a phytase stabilized by phytic acid in the solid state (such as a multi-layered granule) is improved by at least 15%, at least 17%, at least 19%, at least 20%, at least 23%, at least 25%, at least 27%, at least 30%, at least 32%, at least 35%, at least 40%, at least 42%, or at least 45% compared to the control phytase not stabilized by at least 10 millimolal phytic acid at the same conditions. For example, the recovered activity of a phytase stabilized by phytic acid in the solid state (such as a multi-layered granule) is improved by at least 32% compared to the control phytase not stabilized by at least 10 millimolal phytic acid at the same conditions. In one embodiment, the recovered activity of a phytase stabilized by phytic acid in the solid state (such as a multi-layered granule) is improved by at least 15%, at least 17%, at least 19%, at least 20%, at least 23%, at least 25%, at least 27%, at least 30%, at least 32%, at least 35%, at least 40%, at least 42%, or at least 45% compared to the control phytase not stabilized by phytic acid in the range between 10 millimolal and 150 millimolal. In one embodiment, the recovered activity of the stabilized phytase is improved by at least 15%, at least 17%, at least 19%, at least 20%, at least 23%, at least 25%, at least 27%, at least 30%, at least 32%, at least 35%, at least 40%, at least 42%, or at least 45% after admixing said stabilized phytase with at least one food or animal feed ingredient and treating the resulting admixture with, for example, heat (such as steam), increased pressure, increased pH, decreased pH, storage, exposure to surfactant(s), exposure to solvent(s), and/or mechanical stress, compared to the recovered activity of the control phytase not stabilized by phytic acid at a concentration of least 10 millimolal at the same conditions. For example, the recovered activity of the stabilized phytase is improved by at least 32% after admixing said stabilized phytase with at least one food or animal feed ingredient and treating the resulting admixture with, for example, heat (such as steam), increased pressure, increased pH, decreased pH, storage, exposure to surfactant(s), exposure to solvent(s), and/or mechanical stress, compared to the recovered activity of a control phytase not stabilized by phytic acid at a concentration of least 10 millimolal at the same conditions. In another embodiment the recovered activity of the stabilized phytase is improved by at least 15%, at least 17%, at least 19%, at least 20%, at least 23%, at least 25%, at least 27%, at least 30%, at least 32%, at least 35%, at least 40%, or at least 42%, at least 45% after admixing said stabilized phytase with at least one food or animal feed ingredient and treating the resulting admixture with, for example, heat (such as steam), increased pressure, increased pH, decreased pH, storage, exposure to surfactant(s), exposure to solvent(s), and/or mechanical stress, compared to the recovered activity of a control phytase not stabilized by phytic acid at a concentration in the range between 10 millimolal and 150 millimolal at the same conditions. In one embodiment, at least 10 millimolal phytic acid is used for stabilizing phytase in a food or feed pellet which is subjected to or has been subjected to one or more of the following treatments: heating, increased pressure, increased pH, decreased pH, storage, exposure to surfactant(s), exposure to solvent(s), and mechanical stress. One way to determine the thermal stability of an enzyme is to determine the melting temperature (Tm) of the enzyme. In one embodiment, the Tm (such as the DSC Tm) of a phytase (stabilized by at least 10 millimolal phytic acid) is increased by at least 1 C, at least 1 .30, at least 1 .40, at least 1 .50, at least 20, at least 40, at least 60, at least 70, at least 7.5C, at least 7.6C, or at least 80, compared to a control phytase. In one embodiment, the Tm (such as the DSC Tm) of a phytase stabilized by at least 15 millimolal phytic acid is increased by at least 1 C, at least 1 .30, or at least 1 .4C, compared to a control phytase which is not stabilized by at least 10 millimolal phytic acid. For example, the Tm (such as the DSC Tm) of a phytase stabilized by at least 15 millimolal phytic acid is increased by at least 1 .4C, compared to a control phytase which is not stabilized by at least 10 millimolal phytic acid. In one embodiment, the Tm (such as the DSC Tm) of a phytase stabilized by at least 10 millimolal phytic acid is increased by at least 4C, at least 60, at least 7C, at least 7.5C, at least 7.6C, or at least 80, compared to a control phytase which is not stabilized by at least 10 millimolal phytic acid. For example, the Tm (such as the DSC Tm) of a phytase stabilized by at least 10 millimolal phytic acid is increased by at least 7.6C, compared to a control phytase which is not stabilized by at least 10 millimolal phytic acid. In one embodiment, the composition is a liquid such as a liquid feed. In an alternative embodiment, the composition is a solid, such as a granule, or a powder. In one embodiment, the composition is a granule, such as a multi-layered granule. In another embodiment, the composition is a food or animal feed such as a food or animal feed pellet. For example, the composition is a food or animal feed pellet which has been subjected to one or more of the following treatments: heat, increased pressure, increased pH, decreased pH, storage, exposure to surfactant(s), exposure to solvent(s), and mechanical stress. For instance, the composition is a heat-treated food or animal feed pellet which has been heated at a temperature of at least 90C for 30 seconds (such as 95C for 30 seconds). In a further embodiment, the composition is a food or an animal feed ingredient such as a mash. embodiment, the pellet improving composition further comprises at least one food or animal feed ingredient. The pellet improving composition provides, for example, at least 65% of phytase activity to be recovered after food or animal feed pelleting. In another example, the DSC Tm of the phytase in the pellet improving composition is increased by at least 1 °C compared to a control composition in which a control phytase is not stabilized by phytic acid at a concentration of at least 10 millimolal. In a further example, the recovered activity of the phytase in the pellet improving composition is improved by at least 15%, after admixing said pellet improving composition with at least one food or animal feed ingredient and pelleting the resulting admixture with steam treatment for 30 seconds at 90C and/or 30 seconds at 95C, compared to the recovered activity of a control phytase not stabilized by phytic acid at a concentration of least 10 millimolal at the same conditions. In one embodiment, the composition comprises lower inositol phosphates including inositol hexaphosphate, inositol pentaphosphate, inositol tetraphosphate, inositol triphosphate, inositol diphosphate, inositol monophosphate and mixtures thereof resulting from the hydrolysis of said phytic acid by said phytase. Cores, granules and multi-layered granules may be produced by a variety of fabrication techniques including: rotary atomization, wet granulation, dry granulation, spray drying, disc granulation, extrusion, pan coating, spheronization, drum granulation, fluid-bed agglomeration, high-shear granulation, fluid-bed spray coating, crystallization, precipitation, emulsion gelation, spinning disc atomization and other casting approaches, and prill processes. Such processes are known in the art and are described in US Pat. No. 4689297 and US Pat. No. 5324649 (fluid bed processing); EP656058B1 and US Pat. No. 454332 (extrusion process); US Pat. No. 6248706 (granulation, high-shear); and EP804532B1 and US Pat. No. 6534466 (combination processes utilizing a fluid bed core and mixer coating). The core is the inner nucleus of the multi-layered granule or is the granule. The materials used in the core can be suitable for the use in foods and/or animal feeds. US20100124586, W09932595, and US5324649 detail suitable materials for the core. In one embodiment, the core comprises one or more water soluble or dispersible agent(s). Suitable water soluble agents include, but are not limited to, inorganic salts (e.g. sodium sulphate, sodium chloride, magnesium sulphate, zinc sulphate, and ammonium sulphate), citric acid, sugars (e.g. sucrose, lactose, glucose, granulated sucrose, maltodextrin and fructose), plasticizers (e.g. polyols, urea, dibutyl phthalate, and dimethyl phthalate), fibrous material (e.g. cellulose and cellulose derivatives such as hydroxyl-propyl-methyl cellulose, carboxy-methyl cellulose, and hydroxyl-ethyl cellulose), phytic acid, and combinations thereof. Suitable dispersible agents include, but are not limited to, clays, nonpareils (combinations of sugar and starch; e.g. starch-sucrose non-pareils - ASNP), talc, silicates, carboxymethyl cellulose, starch, and combinations thereof. In one embodiment, the core comprises sodium sulphate. In another embodiment, the core consists of sodium sulphate. In some embodiments, the core may comprise a phytase and/or phytic acid. In some embodiments, the core does not comprise phytase. In some embodiments the core is coated with at least one coating layer. In one embodiment the core is coated with at least two coating layers. In another embodiment the core is coated with at least three coating layers. In a further embodiment the core is coated with at least four coating layers. The materials used in the coating layer(s) can be suitable for use in foods and/or animal feeds. US20100124586, W09932595, and US5324649 detail suitable materials for the coating layer. In some embodiments, the fluid bed granulation process is employed traditionally by running and by continuously spraying one layer on top of the next layer with only a brief flushing of the lines and spray nozzles with water for cleaning purposes, without cessation in spray. In some embodiments, the granules can be made by allowing them to dry (fluidize without spray) for an additional time period (e.g. 5 minutes) after the end of each intermediate spray (for example at 70C), and an optional additional drying after the final spray can be performed (for example 20 minutes at 70C). In some embodiments, the additional time period after the end of the intermediate spray is at least 1 , 2, 3, 4, 5, 6, 7, 8, 9, 10, 1 1 , 12, 15, 20, or 25 minutes. In some embodiments the additional time period after the end of the intermediate spray is 2-8, 3-7, or 4-6 minutes. In some embodiments, the temperature of the additional time period after the end of the intermediate spray is at least 50C, 55C, 60C, 65C, 70C, 75C, or 80C. In some embodiments, the temperature of the additional time period after the end of the intermediate step is 60C-80C or 65C-75C. In some embodiments, after the end of the intermediate spray a drying step is performed for 4-6 minutes at 65-75C. In some embodiments, the optional drying after the final spray can be at least 5, 10, 15, 20, 25, or 30 minutes. In some embodiments, the optional drying after the final spray can be 5- 30 or 10-25 minutes. In some embodiments, the temperature of the optional drying after the final spray is at least 50C, 55C, 60C, 65C, 70C, 75C, or 80C. In some embodiments, the temperature of the optional drying after the final spray is 60C-80C or 65C-75C. In some embodiments, the optional drying after the final spray is 15-25 minutes at 65C-75C. In one embodiment, a coating layer comprises one of more of the following materials: an inorganic salt (e.g. sodium sulphate, sodium chloride, magnesium sulphate, zinc sulphate, and ammonium sulphate), citric acid, a sugar (e.g. sucrose, lactose, glucose, and fructose), a plasticizer (e.g. polyols, urea, dibutyl phthalate, and dimethyl phthalate), fibrous material (e.g. cellulose and cellulose derivatives such as hydroxyl-propyl-methyl cellulose, carboxy-methyl cellulose, and hydroxyl-ethyl cellulose), clay, nonpareil (a combination of sugar and starch), silicate, carboxymethyl cellulose, phytic acid, starch (e.g. corn starch), fats, oils (e.g. rapeseed oil, and paraffin oil), lipids, vinyl polymers, vinyl copolymers, polyvinyl alcohol (PVA), plasticizers (e.g. polyols, urea, dibutyl phthalate, dimethyl phthalate, and water), anti- agglomeration agents (e.g. talc, clays, amorphous silica, and titanium dioxide), anti-foam agents (such as Foamblast 882® and Erol 6000K®), and talc. US20100124586, W09932595, and US5324649 detail suitable components for the coating layers. In one embodiment, the coating layer comprises sugars, such as sucrose. In one embodiment, the coating layer comprises a polymer such as polyvinyl alcohol (PVA). Suitable PVA for incorporation in the coating layer(s) of the multi-layered granule include partially hydrolyzed, fully hydrolyzed and intermediately hydrolyzed having low to high degrees of viscosity. In another embodiment, the coating layer comprises an inorganic salt, such as sodium sulphate. In one embodiment, at least one coating layer is an enzyme coating layer. In some embodiments the core is coated with at least two enzyme layers. In another embodiment the core is coated with at least three enzyme layers. In some embodiments, the granules of the present teachings comprise an enzyme coating layer. In some embodiments, the enzyme layer comprises at least one enzyme. In some embodiments the enzyme layer comprises at least two enzymes. In some embodiments, the enzyme layer comprises at least three enzymes. In some embodiments, the enzyme is selected from the group consisting of phytases, xylanases, phosphatases, amylases, esterases, redox enzymes, lipases, transferases, cellulases, hemi-cellulases, beta-glucanases, oxidases (e.g. hexose oxidases and maltose oxidoreductases), proteases and mixtures thereof. Generally, at least one enzyme coating layer comprises at least one phytase, and phytic acid. In one embodiment, the enzyme coating layer comprises at least one phytase and at least one further enzyme selected from the group consisting of phytases, xylanases, phosphatases, amylases, esterases, redox enzymes, lipases, transferases, cellulases, hemi- cellulases, beta-glucanases, oxidases (e.g. hexose oxidases and maltose oxidoreductases), and proteases. The above enzyme lists are examples only and are not meant to be exclusive. Any enzyme can be used in the granules described herein, including wild type, recombinant and variant enzymes of bacterial, fungal, yeast, plant, insect and animal sources, and acid, neutral or alkaline enzymes. In some embodiments, the enzyme coating layer may further comprise one or more additional materials selected from the group consisting of: phytic acid, sugars (e.g. sucrose), starch (e.g. corn starch), fats, oils (e.g. rapeseed oil, and paraffin oil), lipids, vinyl polymers, vinyl copolymers, polyvinyl alcohol (PVA), plasticizers (e.g. polyols, urea, dibutyl phthalate, dimethyl phthalate, and water), anti-agglomeration agents (e.g. talc, clays, amorphous silica, and titanium dioxide), anti-foam agents (such as Foamblast 882 and Erol 6000K available from Ouvrie PMC, Lesquin, France), and talc. US20100124586, W09932595, and US5324649 detail suitable components for granules. Foamblast 882® is available from Emerald Foam Control, LLC. Foamblast 882® is a defoamer which is made with food grade ingredients. In one embodiment, the enzyme coating layer comprises phytic acid and at least one phytase. In other words, the phytase and phytic acid are incorporated into the same layer of a multi-layered granule. In one embodiment, the multi-layered granule comprises an enzyme coating layer comprising a phytase and a coating layer comprising phytic acid that is functionally adjacent to the enzyme layer. In one embodiment, the coating layer comprises phytic acid wherein said coating layer is functionally adjacent to a core comprising phytase and/or an enzyme coating layer comprising phytase. In one embodiment, the outer coating layer of a multi-layered granule comprises one or more of the following coating materials: polymers (e.g. vinyl polymers, polyvinyl alcohol, and vinyl copolymers), gums, waxes, fats, oils, lipids, lecithin, pigments, lubricants, nonpareils, inorganic salts (e.g. sodium sulphate, sodium chloride, magnesium sulphate, zinc sulphate, and ammonium sulphate), talc, and plasticizers (e.g. sugars, sugar alcohols, and polyethylene glycol). In one embodiment, the outer coating layer of a multi-layered granule comprises an inorganic salt (e.g. sodium sulphate), polyvinyl alcohol (PVA), talc or combinations thereof. In one embodiment, the outer coating layer comprises polyvinyl alcohol (PVA) and/or talc. In one embodiment, the outer coating layer prevents or reduces the rate or extent of water, moisture or steam migration into the enzyme layer. The multi-layered granules described herein can be produced by a variety of techniques including: fluid-bed spray-coating, pan-coating, and other techniques for building up a multi- layered granule by adding consecutive layers on top of the starting core material (the seed). See, for example, US 5324649 and US20100124586. In one embodiment, the multi-layered granules are produced using a fluid-bed spray coating process. In one embodiment, the multi-layered granules comprise or consist of a core comprising sodium sulphate; a first coating layer comprising or consisting of phytase, sucrose, starch, phytic acid and rapeseed oil; a second coating layer comprising or consisting of sodium sulphate; and a third coating layer comprising or consisting of talc and PVA. The first coating layer is applied to the core then the second coating layer is applied to the first coating layer and then the third coating layer is applied to second coating layer. In another embodiment, the multi-layered granules comprise or consist of a core comprising sodium sulphate; a first coating layer comprising or consisting of phytase, sucrose, starch, phytic acid and an antifoam agent (such as Foamblast 882®); a second coating layer comprising or consisting of sodium sulphate; and a third coating layer comprising or consisting of talc and PVA. The first coating layer is applied to the core then the second coating layer is applied to the first coating layer and then the third coating layer is applied to second coating layer. Pellets may comprise granules and/or multi-layered granules as described herein according to any of a variety of known pelleting methods, examples of which are described further below. In one embodiment, the pellet comprises phytic acid, phytase and at least one food or feed ingredient, wherein the concentration of the phytic acid is at least 10 millimolal. In one embodiment, the pellet comprises at least one food or feed ingredient and a granule comprising phytic acid and phytase, wherein the concentration of the phytic acid in the granule is at least 10 millimolal. Pellets of the present teachings can be produced by a method in which the temperature of a feed mixture is raised to a high level in order to kill bacteria. The temperature is often raised by steam treatment prior to pelleting, a process known as conditioning. Subsequently, the conditioned feed mixture can be passed through a die to produce pellets of a particular size. The feed mixture can be prepared by mixing granules and/or multi-layered granules described herein with food or animal feed as described herein. Generally, the steam conditioner treats the admixture for about 20 to about 90 seconds, and up to several minutes, at about 85C to about 95C. The amount of steam may vary in accordance with the amount of moisture and the initial temperature of the food or animal feed mix. About 4% to about 6% added steam has been reported in pelleting processes, and the amount is selected to produce less than about 18% moisture in the mash prior to pelleting, or up to about 28% moisture in mash intended for extrusion. An optional expander process can occur for about 4 to about 10 seconds at a temperature range of about 100C to about 140C. The pellet mill portion of the manufacturing process typically operates for about 3 to about 5 seconds at a temperature of about 85C to about 95C. Prior to pelleting, unpelleted mixtures (so-called premixes or precursors, base mixes, mash, and diluents for pellets) typically contain vitamins and trace minerals. Base mixes typically contain food and animal feed ingredients such as dicalcium phosphate, limestone, salt and a vitamin and mineral premix, but not grains and protein ingredients. Diluents include, but are not limited to, grains (for example wheat middlings and rice bran) and clays, such as phyllosilicates (the magnesium silicate sepiolite, bentonite, kaolin, montmorillonite, hectorite, saponite, beidellite, attapulgite, and stevensite). Clays also function as carriers and fluidizing agent, or diluents, for food and animal feed premixes. Mash typically comprises a complete animal diet. For example, the mash comprises or consists of corn, soybean meal, soy oil, salt, DL Methionine, limestone, dicalcium phosphate and vitamins and minerals. In one example, the mash consists of 61 .10% corn, 31 .43% soybean meal 48, 4% soy oil, 0.40% salt, 0.20% DL Methionine, 1 .16% limestone, 1 .46% dicalcium phosphate and 0.25% vitamins and minerals. In one embodiment, a food or an animal feed is produced by admixing at least one food or feed ingredient (such as a mash) with a phytase and phytic acid in solution, steam conditioning the resulting admixture followed by pelleting the admixture. In one embodiment, a food or an animal feed is produced by admixing at least one food or animal feed ingredient (such as a mash) with a phytase and phytic acid in the solid state (such as in a granule such as a multi-layered granule), steam conditioning the resulting admixture followed by pelleting the admixture. For example, an unpelleted mixture of corn meal and soy meal (such as 60% corn meal and 40% soy meal) can be admixed with multi-layered granules comprising phytase and phytic acid and then subjected to steam conditioning at 90C for 30 seconds. The admixture is then extruded to form the animal feed pellets. In some embodiments, the compositions of the present teachings can reside in heat- treated food or animal feed pellets. Such heat-treated food or animal feed pellets can be subjected to a heat treatment (such as steam conditioning) at a temperature of at least 90C for at least 30 seconds (such as 30 seconds at 90C and/or 30 seconds at 95C). The admixture can then be extruded to form the animal feed pellets. In one embodiment, the food or animal feed is a liquid such as a liquid feed. In another embodiment, the food or animal feed is a solid. As used herein, the term animal includes all animals, examples of which include of non-ruminants and ruminants (such as cows, sheep, goats and horses). Examples of non-ruminant animals include mono-gastric animals such as pigs, poultry (such as chickens and turkeys), fish (such as salmon), dogs, cats, and humans. In one embodiment, the animal feed is feed for chickens (chicken feed). In one embodiment, the animal feed is feed for pigs (pig). The food or animal feed may comprise vegetable proteins. Vegetable proteins may be derived from legumes, oil seeds, nuts and cereals. Examples of sources of vegetable proteins include plants from the families Fabaceae (Leguminosae), Poaceae, Cruciferaceae, and Chenopodiaceae. Suitable sources of vegetable proteins are soy beans, soy bean meal, cereals (such as maize (corn), wheat, oats, barley, rye, and sorghum), cereal meals (such as corn meal, wheat meal, oat meal, barley meal, rye meal, sorghum meal, and canola meal), brans (such as what bran, and oat bran), oil seeds (such as rapeseed and sunflower seeds), oil seed meals (such as rapeseed meal), cottonseed meal, cabbage, beet and sugar beet. These vegetable proteins are examples of food ingredients and animal feed ingredients. The food or animal feed may comprise animal proteins. Suitable animal proteins include fish-meal and whey. The food or animal feed may comprise additives. Suitable additives include enzyme inhibitors, vitamins, trace minerals, macro minerals, coloring agents, aroma compounds, antimicrobial peptides (such as Leucocin A, Thanatin, and Tritrpticin), and enzymes. The food or animal feed or ingredients thereof may be a liquid. The food or animal feed or ingredients thereof may be a solid. Examples include corn, wheat or soy meal. The present teachings provide for phytases with various modifications, for example by glycosylation. In particular, the present description relates to the glycosylation of phytase. In some embodiments, the present description relates to the modification or alteration of enzymes to introduce or increase the number of glycosylation sites. This modification can be made to the polypeptide or to the encoding nucleic acid. In some embodiments the modified enzyme is a phytase and in some embodiments the enzyme is phytase BP17. The phytase BP17 amino acid sequence (SEQ ID NO: 1 ) contains three potential N-linked glycosylation sites according to analysis by the NetNGIyc 1 .0 prediction algorithm (http://www.cbs.dtu.dk/services/NetNGIvc/). The asparagine residues that are predicted to be glycosylated are residues N169, N173 and N285 of the mature phytase BP17 sequence (lacking a signal sequence), as indicated in the SEQ ID NO: 1 below bold and underlined. One embodiment of the description involves the production and use of a phytase which is highly glycosylated, for example highly glycosylated BP17, or a homologue, variant or derivative thereof. In some embodiments, the enzyme produced and/or used has more than 75%, for example more than 80%, for example more than 90% and for further example more than 95%, 96%, 97%, 98%, or 99% identity to BP17. BP17. Specifically one or more or all of the following substitutions can be introduced to BP17 (with reference to the position numbering of SEQ ID NO: 1 , lacking a signal sequence) in order to introduce glycosylation sites:-E121 T, P394N, D386N, K202N, N204T, Q151 N and P153S, P373T, and Q76N. In particular, a sequence of the description may comprise K202N and N204T in the same sequence. In a further embodiment of the description, a sequence of the description may comprise Q151 N and P153S in the same sequence. SEQ IN Nos: 5 to 1 1 present variant sequences that may be used in the present teachings (in each case the amino acid changes relative to BP17 are shown in bold and underlined) wherein amino acid substitutions have been introduced to BP17 (SEQ ID NO: 1 ) to increase the number of glycosylation sites. The extent of glycosylation of an enzyme may increase the stability of the modified enzyme. Therefore some embodiments of the description provide more thermostable enzymes, for example enzymes which are more thermostable than wild-type enzymes or enzymes produced using different methods. The present description also provides for nucleic acids encoding and capable of encoding the polypeptides of SEQ ID NO 1 and homologues, variants or derivative thereof. The present description may also relate to the enzyme of SEQ ID NO 1 or a polypeptide derived from the parent enzyme by substitution, deletion or addition of one or several amino acids, such as 2, 3, 4, 5, 6, 7, 8, 9 amino acids, or more amino acids, such as 10 or more than 10 amino acids in the amino acid sequence of the parent protein and having the activity of the parent protein. In some embodiments this enzyme is glycosylated and in some embodiments such an enzyme has increased stability. A further embodiment of the present description provides a method of producing an enzyme of the description, for example an enzyme wherein glycosylation is increased or the enzyme is highly glycosylated. This method involves altering the amino acid sequence of the enzyme, or altering the nucleic acid which encodes the enzyme, to increase the number of glycosylation sites. In some embodiments this alteration involves increasing the number of an N-linked glycosylation sites. In some embodiments this involves introducing the motif is Asn- Xaa-Ser/Thr to the enzyme or introducing sequence which encodes this site to the nucleic acid. In some embodiments one, or two or three or more glycosylation sites are introduced to an enzyme. In some embodiments the method of the description is carried out on a phytase, for example BP17 (SEQ ID NO: 1 ). In some embodiments the method of the description introduces one or more of the following amino acid mutations in order to increase the number of glycosylation sites in a phytase (with reference to the position numbering of SEQ ID NO: 1 ):- E121 T, P394N, D386N, K202N, N204T, Q151 N, P153S, P373T, and Q76N. In further embodiments, the present description also relates to increasing the glycosylation of an enzyme through production methods. In some embodiments the production method used is expression in a filamentous fungi host, for example expression in Trichoderma species fungi and specifically for example in T. reesei. The present description also relates to expression of an enzyme in an altered host, wherein alteration has deleted the function of one of more genes, and in some embodiments has deleted the function of the endogenous endo glucosaminidase gene. In one particular embodiment the present description relates to the expression and production of an enzyme, for example a phytase, and in some embodiments phytase BP17, which may or may not be modified, in Trichoderma species fungi, for example in T. reesei, wherein the endogenous endo glucosaminidase gene has been deleted. In some embodiments, the present description relates to the production and/or use of enzymes, such as phytase, with increased glycosylation. In further embodiments increased glycosylation is encouraged by the use of a host with a deleted endoT gene. In some embodiments the enzyme produced has increased stability compared to an enzyme produced using different methods, especially methods using a different host species and/or a host wherein the endogenous endo glucosaminidase gene is not deleted. Endogenous endo glucosaminidase is a secreted enzyme which removes N-linked glycosylation from other proteins such as phytases. The extent of glycosylation of a protein, such as an enzyme, is greater if it is produced in an endoT-deleted host. According to the description the endoT gene may be deleted by removal, disruption, interference or any method which prevents or reduced the expression and production of EndoT in the host. Exemplary strains are taught for example in WO 09/1 14380, see for instance Example 5. In some embodiments the present description relates to the expression and production of a phytase in an endoT deleted host. In further embodiments the phytase is BP17 or a homologue, variant or derivative thereof, for example having more than 75%, for example more than 80%, for example more than 90%, and for further example more than 95%, 96%, 97%, 98%, or 99% identity to BP17 (SEQ ID NO: 1 ). In some embodiments the host is a filamentous fungi host, for example a Trichoderma species fungi and for further example T. reesei. In some embodiments the phytase has increased stability, for example thermostability is increased compared to a phytase produced by other production methods, or a phytase which is not glycosylated or not highly glycosylated. The extent of glycosylation can be determined by mass spectrometry. In some embodiments, the production methods of the present description provide a more thermostable phytase, which therefore increases the post-processing levels of phytase activity present in feed. In some embodiments the feed processing involves the formation of pellets. In further embodiments the pellets comprising the phytase of the current description have increased post-processing levels of phytase activity. In yet further embodiments the phytase of the current description is better able to survive the pelleting process and retain postprocessing levels of phytase activity. In a further embodiment, facets of the current description can be combined. In other words, an enzyme of the description which has been modified to increase the number of glycosylation sites by altering the amino acid sequence, may be produced in an altered host, for example a host wherein the endoT gene has been deleted. This maximizes the extent of glycosylation of the enzyme. In some embodiments the host is a Trichoderma species fungi, for example T reesei. In some embodiments, the enzyme expressed in the altered host is a phytase, for example BP17 (SEQ ID NO: 1 ), or Ronozyme P-(CT), or a homologue, variant or derivative thereof, for example having more than 75%, for example more than 80%, for example more than 90%, and for further example more than 95%, 96%, 97%, 98%, or 99% identity to BP17 (SEQ ID NO: 1 ), or the commercially available Ronozyme P-(CT), respectively. The following examples are intended to illustrate some embodiments of the present teachings. The phytase used in Example 1 and Example 2 is the phytase BP17 having the amino acid sequence as shown in SEQ ID NO: 1 , made in the EDT-Trichoderma reesei host. The phytase used in Example 3 is the commercially available phytase Ronozyme P-(CT) from DSM. Calculation of percent recovered activity, phytase activity, and DSC were performed as described in the definitions. Phytic acid (Sigma) was incorporated into multi-layered granules comprising phytase to assess whether protection to the phytase against subsequent steam treatment could be achieved. These phytase-containing granules were then mixed with animal feed and passed through an animal feed pelleter that incorporated a steam treatment. Enzyme granules can be produced using a fluid-bed spray process described in US Pat. No. 5324649. Here, a Vector FL-1 fluidized bed spray-coater was used. Phytase was added at 12,000 Units/gram (based on total dry granule weight). Phytic acid was added at 0.10% to 0.40% by weight of the total granule or 15 to 60 mM concentration in the enzyme layer. Sodium sulfate seeds (also referred to as the core) were charged into a fluid bed chamber. The "spray 1 " solution was prepared by dissolving or dispersing sucrose, corn starch, phytic acid and either paraffin oil or rapeseed oil or antifoam Foamblast 882® into ultrafiltered phytase concentrate (UFC). Additional water was added to this mixture in order to keep the total concentration of solids about 40%. Constant stirring was required in order to keep the corn starch and paraffin oil or rapeseed oil or antifoam well dispersed in the enzyme UFC. Spray 1 was applied to the sodium sulfate core already charged to the fluid bed granulator using a top spray process. Spray 1 was applied with an initial spray rate of 6.3 g/min ramping up to a final spray rate of 1 1 g/min over 30 minutes. The atomization air pressure was held between 35 and 40 psi and the bed temperature was held between 43 and 45QC. Subsequent sprays (Spray 2, Spray 3, etc.) were prepared by dissolving and/or dispersing all of the components of this spray solution into water so as to form a solution containing approximately 18 to 40% solids. Sprays containing water insoluble oil, antifoam or corn starch required continuous stirring in order to keep these materials well dispersed. Spray 2 was applied with a constant spray rate of 23.9 g/min. The atomization air pressure was held between 34 and 36 psi and the bed temperature was held between 45 and 47QC. Spray 3 was applied with an initial spray rate of 7.2 g/min ramping up to a final spray rate of 9.2 g/min over 15 minutes. The atomization air pressure was 40 psi and the bed temperature was held between 49C and 50C. Multi-layered granules were harvested after the final spray and phytase activity was determined using above-mentioned the phytase assay. The multi-layered granules were then combined with a mixture of 60% corn meal and 40% soy meal (i.e. the mash) at a ratio of 60 grams of granules to 120 kilograms of corn-soy meal such that the final activity of phytase in the mixture before pelleting was approximately 5 units/gram. immediately placed in a cooling box with a perforated bottom and air flow of 1500 cubic meters per hour. After cooling for 15 minutes, the samples were downsized twice using a sample divider, and 1 kg was taken for lab tests. In the calculations below in Table 1 .1 , it can be seen that for a granule loaded with 0.1 % w/w phytic acid, the level of phytic acid in the enzyme layer is 10.19 millimoles per kilogram of enzyme layer solids or 10.19 millimolal. 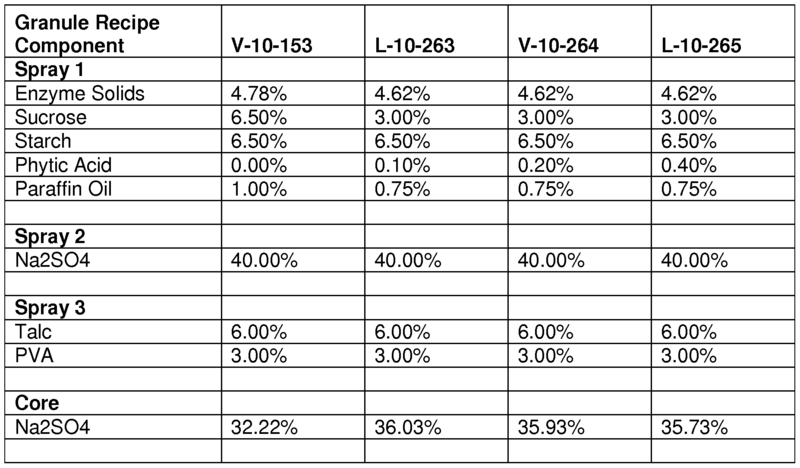 Improvements in pelleting performance have been observed as shown in Table 3 when phytic acid has been used in granules from 0.1 % w/w to 1 .0% w/w (10.19 - 101 .9 millimolal). concentration of phytic acid in the enzyme layer is 101 .9 mM, Phytic acid was obtained from Sigma, and originally was greater than 70% IP6 as determined by HPLC, with the balance being IP5, IP4, IP3, IP2, and IP1 . (In this Table 1 .1 L10263 is L-10-263 which is described below in Table 1 .2; SP1 refers to spray 1 ; SP2 refers to spray 2; SP3 and refers to spray 3. Each "spray" is an aqueous solution or suspension containing the specified component solids, which is sprayed onto the cores within the fluid bed coater). Paraffin oil 0.75% 50.44 !
! Mass of Enzyme Layer (less phytic acid) !
! Core Na2S04 36.03% 2423.00 ! Figure 1 shows the recovered activity obtained after pelleting these Table 1 .2 formulations. Pelleting was performed at both 90C and 95C. It can be seen from Figure 1 that when 0.1 to 0.4% Phytic Acid is present in the enzyme layer of the granule, an improvement of recovered activity of between 19 and 27% is observed at 90 'Ό and an improvement of recovered activity of between 17 and 42% is observed at θδ'Ό when compared to the control granule made without any phytic acid in the enzyme layer, i.e. the control phytase. V-10-153 and V-1 1 -144 are the control samples containing no phytic acid. All other samples (L-10-263, V-10-264, L-10-231 , L-10-265 and L-1 1 -095) contain between 0.10% and 0.40% phytic acid and show an improvement of recovered activity of between 19 and 27% at 90C and an improvement of recovered activity of between 17 and 42% at 95C. (The variability in improvement does not appear to correlate with the level of phytic acid used in these samples, potentially due to the presence of likely excess at the 0.10% level). Table 1 .3 shows the effect of incubation time of the phytic acid with the phytase UFC prior to spraying onto the granule on the phytase activity post-pelleting at both 90C and 95C. 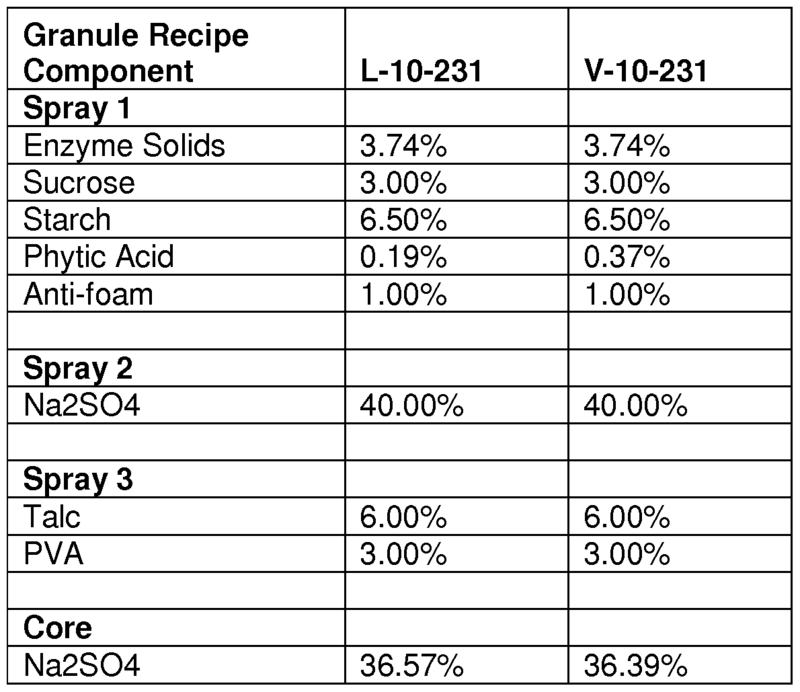 Note that formulations L-1 1 -087, V-1 1 -090, V-1 1 -088 and L-1 1 -088 all have the same composition, which is identical to L-1 1 -095 shown in Table 1 .2. The only difference between these formulations was the time they were allowed to incubate prior to spraying onto the granule. It can be seen that for incubation times between 30 minutes and 6 hours there is no change in phytase activity post-pelleting. After 24 hours of incubation a significant decrease in phytase activity post-pelleting is observed at both 90C and 95C, but this time frame is unusually long and would generally not be encountered when making these enzyme granules in a commercial setting. DSC was performed on a MicroCal VP-DSC using a scan rate of 90C per hour with a concentration of BP17 phytase of 0.5 mg/ml (0.01 mM) in pH 5.5 0.25 M sodium acetate buffer with 20 mM calcium chloride. All phytic acid samples were pH adjusted to 5.5 with sodium hydroxide prior to addition to the acetate buffer and phytase to ensure that all samples were at the same pH of 5.5. The acetate buffer was run in the reference cell of the DSC for all samples. Figure 2 shows the DSC plot for 0.5 mg/ml (0.01 mM) BP17 phytase with and without 15 mM phytic acid substrate added. The melting point (Tm) is indicated for each sample and it can be seen that the addition of 15 mM phytic acid increases the Tm from 72.4C to 73.8C (an increase of 1 .4C) indicating a stabilization of the native state of phytase. pentaphosphate, inositol tetraphosphate, inositol triphosphate, inositol diphosphate, and inositol monophosphate. (The slight height variation of the curves probably relates to the total amount of enzyme undergoing a melting transition. This can vary due to experimental error during sample preparation.) Granule samples made according to Table 1 .2 were analyzed for the distribution of inositol phosphate residues (IP6, IP5, IP4, etc.) using an HPLC based analytical method. The HPLC method is based on ion-exchange using a CarboPac 100 column on a Dionex HPLC- system. A gradient of water and 1 N HCI is run and the eluting material is post-columnn derivitized with a color reagent, 0.1 % Fe(N03)3, 9H20, forming InsP-Fe complexes detectable with UV at 290nm. This method is only able to quantitate from IP6 down to IP2 with IP1 and IPO eluting together with the solvent peak. As shown in the below Table 2.1 , it was not possible to detect any phytate (IP6) in either of the samples. For the 0.1 % phytic acid and 0.5 mg/ml phytase granule samples a small amount of IP3 was present. The liquid samples did not give rise to any peaks apart from the "solvent front". This peak was quite big for the most concentrated of the samples, which suggests total degradation to IP1 , IPO and inorganic phosphate. 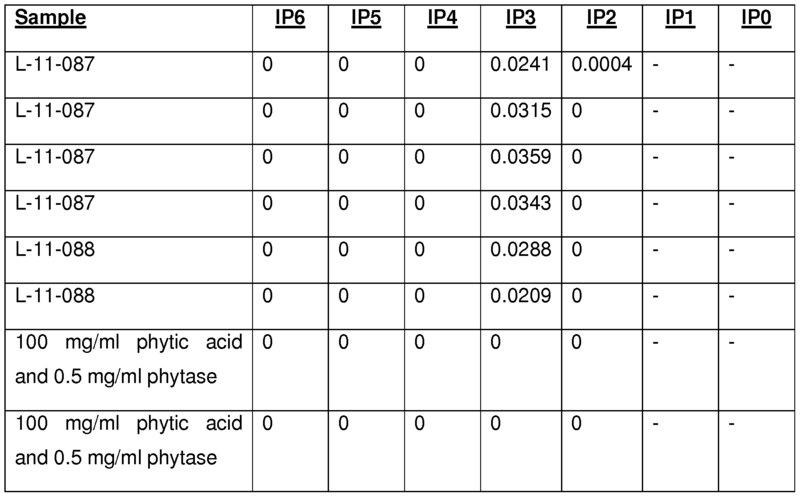 Table 2.1 shows that in the granule phytic acid has hydrolyzed to IP3, IP2, IP1 and IPO, and, that no IP6 is present. This supports the hypothesis that the stabilizing entity is IP3, IP2, IP1 (IPO was eliminated based on DSC data; IPO is unlikely to be the stabilizing entity because when IPO (inositol) was tested with phytase using DSC as is shown in Figure 3, no increase in Tm was observed). The enzyme layer contains 12,000 U/g phytase. Units in the table are HPLC peak areas. A dash (-) indicates that the value was not determined. Figure 4 shows a plot of the DSC Tm determined for phytase in the presence of phytic acid at a concentration between 0 and 150 mM. It can be seen that the Tm of phytase increases from 72.4C to 80C at 150 mM phytic acid, showing a 7.6C increase in Tm over phytase without phytic acid added. This is indicative of a very strong stabilizing effect from the phytic acid. It was not possible to determine the Tm of phytase when phytic acid was higher than 150 mM because at this concentration the phytic acid was interfering with the DSC measurement of the phytase. To explore the generalizability of the phytic acid stabilization on other phyases, a DSC experiment was performed using phytase extracted from DSM's granular Rononzyme P-(CT) product. The phytase enzyme was extracted from the granule by dissolving it in pH 5.5 sodium acetate buffer at a concentration of 10 grams granule solids per 100 grams of buffer for 1 hour. This material was then filtered through a 0.20 micron filter and then buffer exchanged 5 times using pH 5.5 sodium acetate buffer and a 10 K molecular weight cutoff Centricon®tube. Total protein concentration was measured using a Lowry type assay on a Konelab® automated chemical analyzer. In Figure 5, one sees a similar type of stabilization (Tm increase) in the presence of phytic acid as was earlier observed with BP17. The higher Tm is likely because this phytase is a different enzyme sequence than the BP17 of previous examples. The effect of phytic acid on Tm is similar to BP17 phytase and the slopes appear similar. Although the foregoing teachings have been described in some detail by way of illustration and examples for purposes of clarity of understanding, it will be apparent to those skilled in the art that certain changes and modifications may be practiced without departing from the spirit and scope of the present teachings. Therefore, the description should not be construed as limiting the scope of the present teachings which are delineated by the appended claims. 1 . A method for increasing the stability of phytase in a composition, the method comprising introducing at least 10 millimolal phytic acid to said composition, wherein the phytase and the phytic acid are in functional proximity. 2. The method according to claim 1 , wherein the phytase and phytic acid are in solution. 3. The method according to claim 1 , wherein the phytase and phytic acid are in the solid state. 4. The method according to claims 1 or 3, wherein the phytase and phytic acid are spray dried onto a solid support. 5. The method according to any of claims 3 or 4, wherein the phytase and phytic acid are incorporated into a granule. 6. The method according to claim 5, wherein the granule is a multi-layered granule. 7. The method according to any of claims 3-6, wherein the phytase and phytic acid are incorporated into a same layer of a multi-layered granule. 75%, at least 80%, at least 85%, at least 90%, or at least 95% after food or animal feed pelleting. 9. The method according to any of claims 1 -8, wherein the DSC Tm of the phytase is increased by at least 1 C, at least 1 .3C, at least 1 .4C, or at least 1 .5C, compared to a control phytase not stabilized by phytic acid at a concentration of at least 10 millimolal. 10. The method according to any of claims 1 -9, wherein the DSC Tm of the phytase is increased by at least 2C, at least 4C, at least 6C, at least 7C, at least 7.5C, at least 7.6C, at least 8C, compared to a control phytase not stabilized by phytic acid at a concentration of least 10 millimolal. 1 1 . The method according to any of claims 1 -10, wherein the phytase activity is at least 15%, at least 17%, at least 19%, at least 20%, at least 23%, at least 25%, at least 27%, or at least 30% higher than phytase activity of a control phytase not stabilized by phytic acid at a concentration of at least 10 millimolal, after admixing the stabilized phytase with at least one food or animal feed ingredient and pelleting the resulting admixture with steam treatment. 12. The method according to any of claims 1 -10, wherein the phytase activity is at least 15%, at least 17%, at least 19%, at least 20%, at least 23%, at least 25%, at least 27%, or at least 30% higher than phytase activity of a control phytase at a concentration in the range between least 10 millimolal-150 millimolal, after admixing the stabilized phytase with at least one food or animal feed ingredient and pelleting the resulting admixture with steam treatment. 13. The method according to claims 1 1 or 12, wherein the food or animal feed is a liquid. 14. The method according to any of claims 1 -13, wherein the phytase is phytase BP17. 15. The method according to any of claims 1 -13 wherein the phytase is Ronozyme P-(CT). 17. A granule composition comprising phytic acid and phytase, wherein the phytase and the phytic acid are in functional proximity. 18. The composition according according to claim 17 wherein the phytic acid is at least 10 millimolal, at least 20 millimolal, at least 30 millimolal, at least 50 millimolal, at least 80 millimolal, or at least 100 millimolal, wherein the phytase is present at no more than 500 millimolal, 400 millimolal, 300 millimolal, 200 millimolal, 150 millimolal, or 100 millimolal. 19. The composition according to claim 18 wherein the phytic acid is 10-100 millimolal, 20-90 millimolal, 30-80 millimolal, or 40-70 millimolal. 20. The composition according to any of claims 17-19, wherein the phytase is stable as compared to a control phytase. 21 . The composition according to any of claims 17- 20, wherein the phytase and phytic acid are spray dried onto a solid support. 22. The composition according to any of claims 17- 21 , wherein the phytase and phytic acid are incorporated into a multi-layered granule. 23. The composition according to claim 22, wherein the phytase and phytic acid are incorporated into a same layer of the multi-layered granule. 24. The composition according to claim 20, wherein the stability comprises increased DSC Tm. 25. The composition according to claim 24 wherein the DSC Tm of the phytase is increased by at least 1 C, at least 1 .3C, at least 1 .4C, or at least 1 .5C, compared to a control phytase not stabilized by phytic acid at a concentration of at least 10 millimolal. 26. The composition according to claim 20, wherein the DSC Tm of the phytase is increased by at least 2C, at least 4C, at least 6C, at least 7C, at least 7.5C, at least 7.6C, at least 8C, compared to a control phytase not stabilized by phytic acid at a concentration in the range of at least 10 millimolal. 27. The composition according to any of claims 17-26, wherein the recovered activity of the phytase is at least 15%, at least 17%, at least 19%, at least 20%, at least 23%, at least 25%, at least 27%,or at least 30% higher, after admixing the phytase with at least one food or animal feed ingredient and pelleting the resulting admixture with steam treatment, as compared to a control phytase not stabilized by phytic acid. 28. The composition according to any of claims 17-26, wherein the recovered activity of the phytase is at least 15%, at least 17%, at least 19%, at least 20%, at least 23%, at least 25%, at least 27%, at least 30%, at least 32%, at least 35%, at least 40%, at least 42%, or at least 45% higher, after admixing the stabilized phytase with at least one food or animal feed ingredient and pelleting the resulting admixture with steam treatment, as compared to the recovered activity of a control phytase not stabilized by phytic acid at a concentration of at least 10 millimolal. 29. The composition according to any of claims 17-28, comprising lower inositol phosphates including inositol hexaphosphate, inositol pentaphosphate, inositol tetraphosphate, inositol triphosphate, inositol diphosphate, inositol monophosphate and mixtures thereof resulting from the hydrolysis of the phytic acid by the phytase. 30. The composition according to any of claims 17-29, wherein the phytase is phytase BP17 or Rononzyme P-(CT). wherein the recovered activity of the phytase is at least 15%, at least 17%, at least 19%, at least 20%, at least 23%, at least 25%, at least 27%, or at least 30% higher as compared to a control phytase not stabilized by at least 10 millimolal phytic acid. 33. A pellet composition comprising a granule, wherein the granule comprises phytic acid and phytase in functional proximity, wherein the concentration of phytic acid is at least 10 millimolal. 34. The composition according to claim 33 wherein the granule is a multi-layered granule. 35. The composition according to claim 34, wherein the phytase and phytic acid are incorporated into the same layer of the multi-layered granule. 36. The composition according to any of claims 17-31 and 33-35, made according to any of claims 1 -16 and 32, wherein the granule further comprises a sodium sulfate core, wherein the phytic acid and phytase are included in a layer surrounding the sodium sulfate core, wherein the phytic acid and phytase layer comprises starch, sucrose, and rapeseed oil, the composition further comprising a first outer coating comprising sodium sulfate, and a second outer coating comprising PVA and Talc. 37. The composition according to any of claims 17-31 and 33-35, made according to any of claims 1 -16 and 32, wherein the granule further comprises a sodium sulfate core, wherein the phytic acid and phytase are included in a layer surrounding the sodium sulfate core, wherein the phytic acid and phytase layer comprises starch, sucrose, and rapeseed oil, the composition further comprising a first outer coating comprising PVA and Talc, a second outer coating comprising sucrose and starch, and a third outer coating containing PVA and Talc. pelleting the resulting admixture with steam. 40. The method according to claim 39 wherein the coating comprising a salt. 41 . The method according to claim 40 wherein the salt is selected from the group consisting of sodium citrate, NaCI, Na2C03, NaN03, Na2HP04, NH4CI, (NH4)2HP04, NH4H2P04, (NH4)2S04, KCI, K2HP04, KH2P04, KN03, Na2S04, K2S04, KHS04, MgS04, ZnS04, and CuS04. 42. The method according to any of claims 39-41 wherein the concentration of phytic acid is at least 10 millimolal. 43. The method according to any of claims 39-42 wherein the phytase is BP17. 44. The method according to any of claims 39-43 wherein the phytase is Ronozyme P-(CT). ES2221181T3 (en) 2004-12-16 Phytase compositions of high activity.